James Watson who won the Nobel Prize in 1962 for discovering the structure of DNA sold off the gold medal for an amazingly high price of $4.1 million at an auction house in New York to an anonymous bidder over the telephone. This makes it the most expensive Nobel Prize ever sold at an auction. Christie’s representatives at Manhattan were surprised too with the medal fetching much more than what they had expected. While $2.5-3.5 million could have been thought of, this was something they had not even imagined! The phone based bidder who did not wish to disclose his identity will now shell out a whopping $4.76 million before the medal can be taken home. That includes the fee for the auction house. This is the first time that a living Nobel Laureate has gone on to sell his gold medal- one of the most coveted awards on the planet. Watson has never shied away from voicing his views on race and gender related issues. He was suspended from his post as a chancellor of the Cold Spring Harbor Laboratory in Long Island, New York in 2007 when he had drawn flak for suggesting that black people were perhaps not as intelligent as whites. Watson told Nature that his motivation for selling the medal is a chance for redemption. He plans to donate some of the proceeds to Cold Spring, where he still draws a $375,000 base salary as chancellor emeritus, and also to University College Cork in Ireland to help establish an institute dedicated to the mathematician George Boole. “I’m 52% Irish,” Watson said by way of explanation. 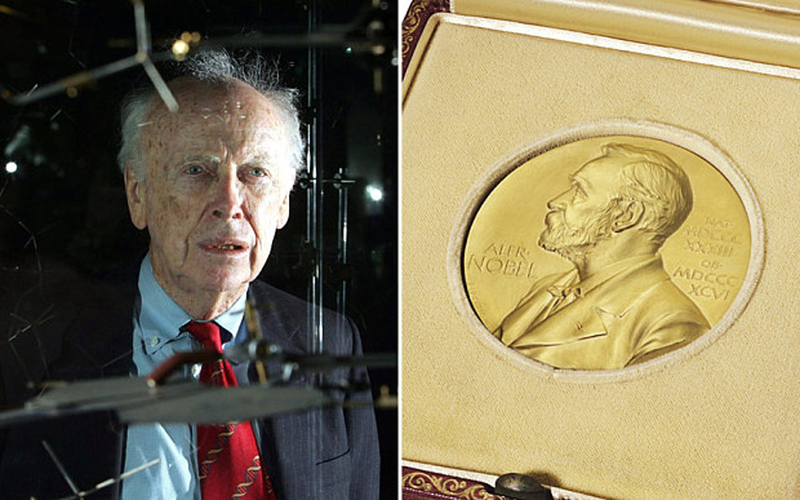 A year ago, Francis Crick who had shared the 1962 Nobel with Watson had sold his award for $2.27 million. “I wanted to be at least equal to Crick, but this exceeded his,” said a visibly pleased Watson after the auction had ended. Besides the medal, Watson also sold his Nobel acceptance speech for $365,000 and his lecture for $245,000. Its NOBEL not noble, makes the piece look amateurish and sloppy. After all, James Watson with his controversial remarks, proved once more that no human can escape from the evolutionary baggage and that human intelligence is only a byproduct of altered but inherited genes!